With the 2015 North American International Auto Show well underway in Detroit, automakers are revving engines by taking the all-electric line-up of Tesla head-on and showcasing the very first 3D-printed vehicle. All eyes were on General Motors, as the company revealed a new concept car that is scheduled to become reality by 2017: the Chevrolet Bolt. Not to be confused with the Volt – a gas/electric hybrid that first made its debut in 2010 – the Bolt is an all-electric vehicle that will reportedly be capable of traveling more than 200 miles on a single charge. Just as important as its range, though, is the price point, and in that category Bolt also promises to be competitive, if not cheaper, than the products of other manufacturers – namely Tesla. According to GM, the car will sell for about $30,000. READ MORE:US’ biggest electric car maker Tesla gives away its patents – but why? So far, there is no precise release date for the vehicle, though it’s possible the Bolt could arrive some time in the next year or year and a half. Plunging gas prices have made some question the wisdom of investing heavily in electric vehicles, but automakers like GM believe prices will eventually spike again and are looking towards the future. "We're pretty convinced that this is the right vehicle at the right time. We've got this pretty much nailed down and we know how to do it,” said GM North America President Alan Batey to the Detroit News. “We would not have today come here and talked about 200 miles and $30,000 if we didn't really know how to make that happen." GM touted the new Bolt as built with crossover aesthetics in mind, as well as lightweight materials such as aluminum, magnesium, and carbon fiber. Owners can also use their smartphone as keys to the car – which features a 10-inch touchscreen inside – and the Bolt will be capable of self-parking. With Tesla looming large in the electric car market, GM was not shy about its target. "They are for the rich and famous,” Batey said, referring to Tesla. “This is for the people. I would probably counter and say I haven't seen Tesla with anything like this." Of course, Tesla is also hard at work on designing a more affordable version of its own electric vehicles. The company’s current Model S starts at $70,000, but the upcoming Model 3 – expected to be unveiled this year and on sale around the same time as the Bolt – is intended to sell for about $35,000 while hitting a range of roughly 200 miles-per-charge. In a statement, Tesla welcomed the Bolt’s introduction as a sign that electric cars have a bright future ahead of them. "Tesla is always supportive of other manufacturers who bring compelling electric vehicles to the market," the automaker said. 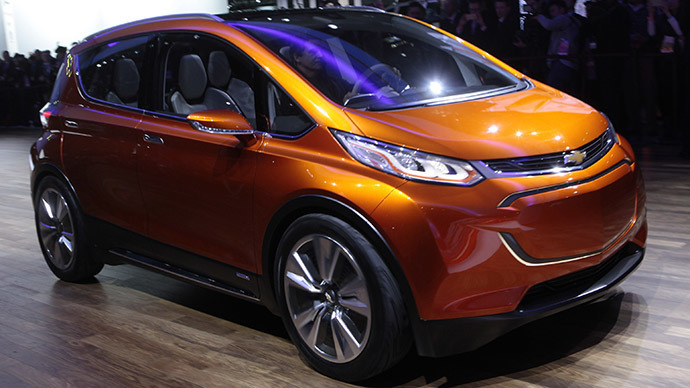 "We applaud Chevrolet for introducing the Bolt and are excited to learn more about the product." Last year, the company opened its patents to rivals and anyone else willing to make use of them, indicating that it sees competition as necessary for electric cars to truly become mainstream. The more companies that enter the market, the more incentive there will be to invest in infrastructure for these types of vehicles (such as charging stations, etc. ), and the more convenient owning an electric car will become. Following the Bolt’s announcement, Japanese automaker Nissan also announced it is working on its own competitor, a follow-up to the Leaf that will go toe-to-toe with the Bolt and Model 3. Elsewhere at the auto show, an Arizona-based company called Local Motors wowed attendees by using a 3D printer to build a car right on the show floor. Named the “Strati,” the car is manufactured out of carbon fiber-infused plastic, MLive reported. The Strati’s frame and panels can be printed in a “micro-factory,” or a space of about 40,000 square feet, before the car needs to be attached to other parts that can’t be printed – such as the electric battery, motor, tires, and suspension. All told, it takes about 44 hours to print the car, though Local Motors is trying to increase the speed so that it will only take one day. The Strati isn’t exactly a powerhouse – it tops out at 25 miles per hour – but the fact that it exists is impressive enough in its own right. According to the Associated Press, CEO Jay Rogers is hoping to start selling the Strati in a range from $18,000 to $30,000, though he acknowledged that the model still needs to undergo “extensive testing” before it can hit the commercial market. Still, Local Motors is planning to sell its first set of 3D-printed cars later this year. Micro-factories, meanwhile, are planned to open in Tennessee and near Washington, DC.